so to the sea I took. and my blasphemy at bay. Loyal only to my craft. and to my craft – my loyalty. 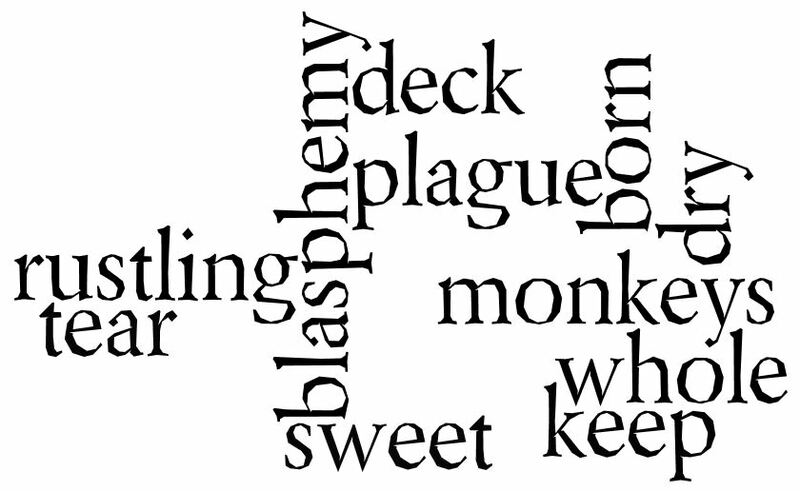 This entry was posted in conflict, evil, poetry, sin, spirituality, the sunday whirl, Wordle and tagged God, nature, poetry, spirituality, the sunday whirl, wordle by The Writer's Village. Bookmark the permalink. i was kind of partial to that first line, too. I believe the sea calls to us in the loudest and most subtle ways…it is the birth place of beginnings. Ahh! If it’s dry you are its Rum you need in your belly, then a real sailor you will be! Man’s constant draw to the sea is beautifully illustrated in your poem. Aargh, matey. the spirit of the Spirits. Spoken in a truly sea-soned fashion. A metaphor for writing maybe…sometimes it does seem like we are all alone out there floating on the waves…and yet waves anchor and maybe even draw us into the shore..
For me, it was a metaphor for cleansing – finding a discipline and a spiritual center. “Avoiding port”—you could take this two ways, you know? First, as avoiding coming into a landing place. Second, as avoiding the alcoholic beverage. So which is it? Maybe one, maybe the other, I suppose! nice twist with the avoiding port as an alcoholic beverage. It hadm’t crossed my mind in that way. the journey, the vessel, and the sea – dedication – all saving graces.